Adams, MA, has an interesting history. The Bucklins are a part of it. 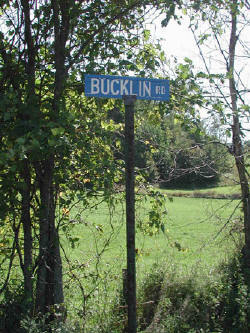 This is a photo of Bucklin Road in Adams, on which rural road (with still only three houses on it in 2002) was the site of the 1775 house of Jeremiah Bucklin. After the French were defeated at Quebec in 1759 by British and American Forces, it became practical for Massachusetts and Rhode Island settlers to move to the area on the west and north of the Massachusetts claims. Many Bucklins then left their parent’s areas in Massachusetts and Rhode Island and ventured into the new lands of the Berkshire, Massachusetts area and other near areas (in present New York, Vermont, and Maine). Berkshire County was formed in 1761 out of Hampshire County. (Hampshire County was organized when the Massachusetts Bay Colony organized counties, in 1643, out of the land that the MBC considered part of their territory, even though the Dutch claimed some of the same land as part of New York.) Berkshire County is on the extreme west of Massachusetts. In 1762, the General Court of the Colony of Massachusetts sold at auction the tract of land which now comprises Adams and North Adams. Young Quaker families from Smithfield, RI and Dartmouth, MA started to buy up the settling lots from the original land speculators who had purchased at the auction. In addition to the Quaker community, a large population of Baptists from the Providence, RI area, settled primarily on Stafford Hill and called their settlement New Providence. The 17th and 18th century Bucklins were frequently ardent Baptists. Some of the Baptist Bucklins were in the group that moved to Adams and the nearby town of Cheshire. “Here they established their church and sent for the pious Werden, their former pastor, who ministered to them in spiritual things until in 1808, the Master called him home. The following is a list of the members of this church in the wilds of Berkshire, the First Baptist Church of the present Cheshire, as they came from Coventry: Rev. Peter Werden, Eunice Bennet, Joab Stafford, John Lee, Betsy Read, Samuel Low, John Bucklin, Deliverance Nichols, Joseph Bennet, Mercy Werden, Martha Lee, John Day, Alma Low. These members organized the church August 28th, 1769, and Elder Peter Werden, of Warwick, became their pastor in March, 1770.” History of the Town of Cheshire, p. 22. That portion of New Providence which was west of Stafford Hill and east of the river was considered the best farm land. Lot No. 1 was sold by the the original land speculators to John Bucklin. “[John Bucklin]…developed the early mill privilege in Adams and is called a wheelwright in his deeds. The site of his house is to be see on the west side of [a road which enters New Providence in the narrow valley between Mount Amos and Stafford Hill and runs northwesterly to Cheshire Harbor]…In 1806 Darius Bucklin sold the north end of the lot…[Nicholas Brown] bought 80 acres of the south end…In early times those who died of small pox were not buried in the public cemetery and when Jerusha Eaton Bucklin, wife of John died of this disease in 1776, she was buried on the farm, near the foot of Mt. Amos, where her grave may still  be seen. The spreading branches of the Bucklin family tree enroll a vast number, some of whom still reside in Cheshire and Adams.” Over Pathways to the Past, p. 56. The Bucklins, as families, were generally loyal and sacrificing patriots of the revolution. (But see the story of one young Bucklin lass in Vermont who married one of the best military men and gallant spies — for the English.) The local Adams colonists that were Baptists were fiery patriots and political activists who honored a forceful and radical hero of the American Revolution – Samuel Adams, by naming the town Adams. Even some of the Quakers of Adams laid aside religious conviction in favor of survival of the country and bore arms. By the time the Town of Adams was incorporated in 1778 these two non-conformist religious groups dominated the area to the extent that Adams was a rare Massachusetts town with no Congregational minister. 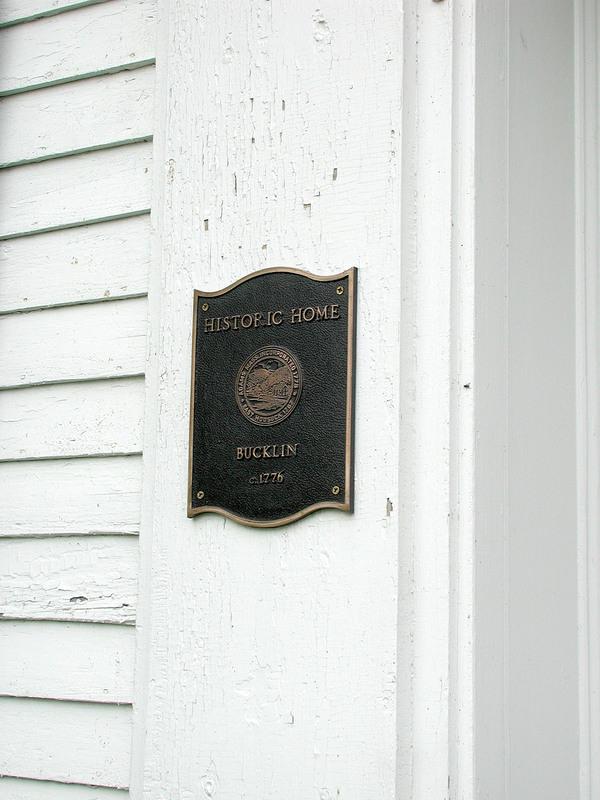 The Adams Historical Society, or the Adams town tourism center, can direct you to the house of Jeremiah Bucklin, which is at 171 Bucklin Road in Adams, MA, but it is not easy getting there. The Bucklin family was one of the Baptists who originally settled in the Stafford Hill area they named New Providence. 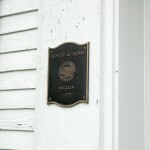 Jeremiah bought this property in 1775. His son, John, later moved to Center Street where he was involved in early manufacturing. This house is unique for its preserved beauty and idyllic setting. 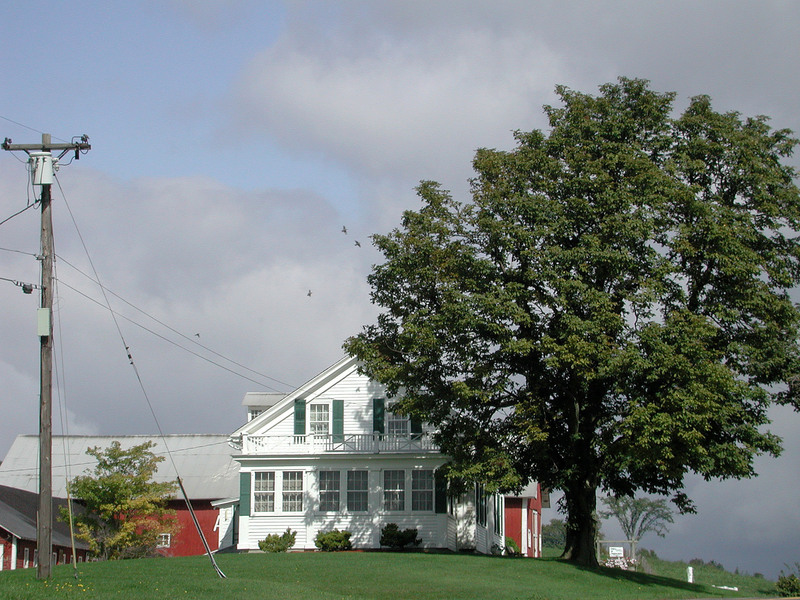 The property is a lovely home, built in 1776, and still used as a farm today after over 200 years of operation. Obviously, from the size of the home, and the choice land he purchased, Jeremiah was a man of substantial assets. Jeremiah Bucklin was one of the founders of the Baptist church in Adams. 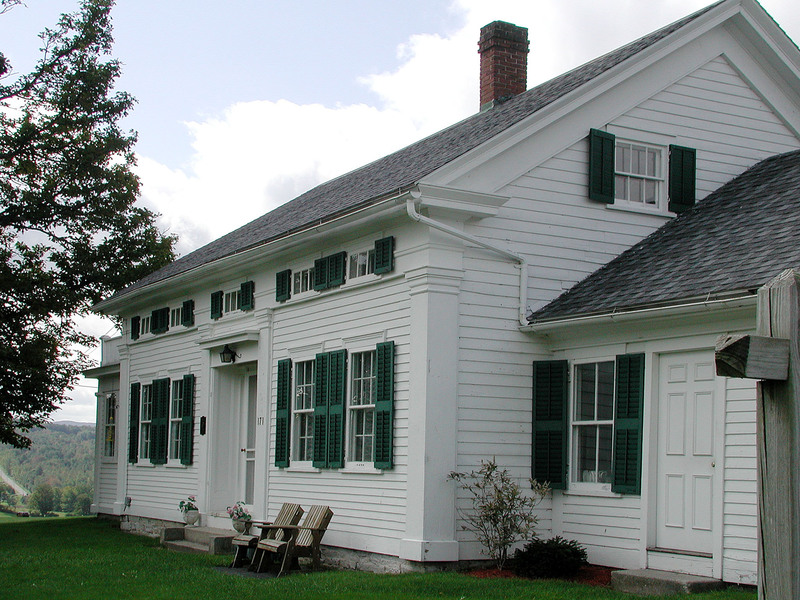 The founders quickly asked Elder Peter Werden of their home church in Rhode Island to be their pastor in Adams; and Werden came. Werden was the nephew of the Mary Worden who had married Joseph Bucklin 3rd in Rhode Island. Joseph Bucklin 3rd was a deacon of a Baptist church there, and was a substantial merchant, having built grist mill and linen and wool shops there. In short, Bucklins of the day were frequently successful and Baptist, as well as Revolutionists. Volume 2 page 755 – Bucklin, Darius, Adams. Private, Capt. Samuel Low’s co., Col. Benjamin Simonds’s (Berkshire Co.) regt. ; enlisted Oct. 13, 1780; discharged Oct. 21, 1780; service, 9 days; marched to the Northward by order of Gen. Fellows on an alarm; also, Capt. Levi Brown’s co., Col. Asa Barnes’s (Berkshire Co.) regt. ; enlisted Oct. 30, 1781; discharged Nov. 7, 1781; service, 9 days; company detached and marched to join Gen. Stark at Saratoga on an alarm. Volume 2 page 755 – Bucklin, Jeremiah. Private, Capt. Ezra Whipple’s co., Col. Benjamin Simonds’s (Berkshire Co.) regt. ; enlisted Oct. 14, 1780; discharged Oct. 19, 1780; service, 5 days; marched to Castleton by order of Gen. Fellows on an alarm. History of the Town of Cheshire, by Emma Pititclerc and Ellen Raynor (Berkshire Historical Society, 1885), p 103, says this about “Captain Joseph Bucklin of Cheshire…son of Darius Bucklin…was given command of a company in the 9th Berkshire Regiment, in which were enlisted men from Cheshire….At Pittsfield…men were quartered there ready for service. To each was given a bounty of $16 for five years and 160 acres of public land.” Adams and Cheshire are close together, was there another Darius and John father-son relationship in Cheshire or is this a mistake in identity by one or another of the researchers?.